STAMFORD, Conn.--HARMAN International Industries, Incorporated (NYSE: HAR), the premier connected technologies company for automotive, consumer and enterprise markets, today announced that the company has been recognized by Fast Company as one of the Top Ten Most Innovative Companies in Automotive, at #7 on the 2016 list. Fast Company highlighted Individual Sound Zones (ISZ) as HARMAN’s standout innovation. HARMAN’s ISZ is groundbreaking in-cabin technology that enables drivers and passengers to personalize their own audio experiences with limited disruption or interference from other vehicle occupants, providing for virtual, simultaneous, in-car entertainment systems. Digital signal processing has been specifically tuned to the vehicle cabin and speakers to reduce the signals from other zones, regardless of whether they are music, voice or other noises. ISZ utilizes a vehicle’s existing speakers with the addition of headrest speakers along with thin and flat Electro Dynamic Planar Loudspeakers in the vehicle ceiling. Passengers can still hear other sounds in the cabin, but those sounds are controlled to limit distractions to each passenger’s own sound experience. ISZ can be integrated into any HARMAN in-car audio system via the amplifier and is available to all automakers. HARMAN approaches innovation as a mix of extensive R&D, creative collaboration with best-in-class organizations and through the pursuit of strategic acquisitions. Over the past year HARMAN has introduced its powerful automotive computing platform, Life-Enhancing Intelligent Vehicle Solution (LIVS), partnered with Microsoft to integrate elements of Microsoft Office 365 productivity suite into HARMAN infotainment systems, and further enhanced the protection provided by its robust 5+1 automotive cyber security architecture with the acquisitions of Redbend, Symphony Teleca and TowerSec (pending customary closing conditions and regulatory approvals). 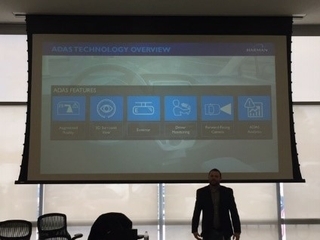 HARMAN launched numerous automotive safety features, including pupil-based driver monitoring to measure the cognitive load of drivers. HARMAN is joined by a number of its automotive partners on the Most Innovative in Automotive list, including Hyundai, Ford and Tesla. HARMAN partner Audi is listed a top innovator in Design, and additional partners outside of automotive are recognized for their groundbreaking contributions, including Alphabet, Apple, Google, Indiegogo, Microsoft and Under Armour. Most Innovative Companies is one of Fast Company’s most significant and highly anticipated editorial efforts of the year. To produce the 2016 list, the magazine’s editors spent a full year gathering and analyzing data on companies around the globe. For the first time, Fast Company enlisted machine intelligence to help inform the list: Quid, a San Francisco-based startup, used its software to create topographical maps of innovation across more than 40 sectors of the economy. Fast Company’s Most Innovative Companies list is available online at www.fastcompany.com/MIC.